Dialexis Program Offerings | Dialexis Inc.
Dialexis operates on the belief that “simplicity lies on the other side of complexity.” We are committed to providing the best solutions and resources for sales growth, leadership advancement and culture shift. Dialexis has been invited into many Ethisphere nominated organizations due to our ethical standards. Our practices are based upon real world experience. Our work is simple and quantifiable. 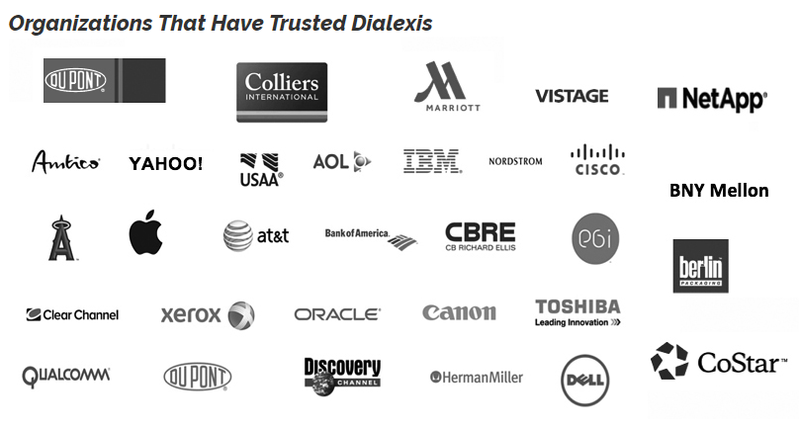 We have been given the opportunity to work with Fortune 500 clients that have made a bold commitment to a relationship with Dialexis. Through this joint partnership they have realized significant ROI in Leadership & Sales performance while Dialexis has experienced the benefit of working with world class ethical organizations. A powerful Value Statement enables even the newest salesperson the opportunity to initiate immediate interest when contacting a new prospect. Knowing what to say and how to say it generates more qualified appointments. The process of developing compelling value statements combined with handling some of the most common objections is accomplished by creating customized value statements and multiple responses for objections for each product line or vertical in a workshop format. This session is recommended after the SOAR Contact course to ensure the SOAR Live Dialing day will result in the best results possible for setting 1st meetings! Qualifying or refining interest offers the salesperson the opportunity to better understand the intention or need of the new prospect. When a new contact says “send me something” most salespeople believe either that is the prospects way to get off the phone (no interest) OR the salesperson often assumes that the “send me something” request is a statement of interest and in fact it may be, but then again it may not be. Qualifying this familiar request provides the salesperson with authentic pipelines vs pipedreams! The impact of delivering SOAR Selling ‘live’ can’t be understated. Typical responses from attendees are; “I wish I would have known this years ago; my career would have advanced so much faster!” or “I never thought this could work, I can’t believe it!” or “The live dialing segment of this program is electric and brings everything together!” Experiencing SOAR live dialing brings the components of C-Level Contact front and center in a way that is unpresented from other training programs. Although attendees frequently enter the program as sceptics, doubtful that a 90% contact rate could be achieved with any program, they are quickly converted. Once live dialing takes place, the mental crossover from sceptic to believer is powerful. Schedule meetings live during the training session! SOAR clearly differentiates itself from other selling systems by the mere fact that we demonstrate how to get in not just what to do once you get in! The Dialexis Metric platform will measure the increase in contact, appointments, revenue pipeline and closed revenue from baseline. As shown in our work with Fortune 500 companies, when measured over a 12-week period, SOAR delivers a 200%-2000% ROI. Participants will understand the power of LinkedIn, experience a variety of tools and how to use those tools most effectively in an effort to connect with Decision Makers and High Influencers. The outcome delivers a strategic process for maximizing the profiles of key targets. Additionally, attendees will learn how to maximize the power of SOAR Selling with LinkedIn. Enterprise Account Capture is a baseline approach for acquiring Net-New Logo’s. Considering that all ‘oil wells dry up’, the senior sales professional is encouraged to strategically prospect for new logos. This program instructs select sales professionals how to strategically prospect at a high level utilizing SOAR Connector Sheeting along with Internet/Social Media research. Connector Sheeting allows the senior sales professional to create an immediate connection with a new logo and connect on the basis of the corporation’s key initiatives. Once contact is made, ordinary value statements are transformed into ‘authentic conversations’ through the use of connector sheeting. MINDSET! The Critical Missing Piece of Top Performance. The assessment of a salespersons’ performance is best achieved by examining their Mindset and their ability to execute (Mechanics.) Experience reveals that Mindset is generally the missing link or at the crux of mediocre performance. Yes, salespeople typically are missing the solid base of mechanics when it comes to “how” to drive new business or get in front of new decision makers. Bottom-line, providing salespeople with sound mechanics doesn’t always result in top performance. As mentioned, the culprit is often Mindset. This segment is essential at all levels of sales to inspire, motivate and have each person achieve their top performance! Once the initial first meeting is set – it is now up to the salesperson to relate to the potential new client by understanding their “triggers” such as why they would consider moving forward or even listening. Salespeople work hard to get the initial appointment and yet they tend to fail miserably by missing the mark during their first meeting. Its critical to understand client “triggers” or why they are interested in learning more. Is it out of pain they have a problem or due to a desire to move forward they have a vision of something better – these are both “triggers.” This working session focuses on how to initially listen for the triggers while setting the first meeting and then outlines the framework for creating a successful meeting! DiSC for the Salesperson is classroom training that uses online pre-work, engaging facilitation with contemporary video and online follow-up to create a personalized learning experience. Participants learn how to read the styles of their customers. The result is salespeople who adapt their styles to connect better—and close more sales. Applying The Canoe Theory principles, based upon the book The Canoe Theory, is at the core of building a strong united team. The fundamental principle of The Canoe Theory is “simplicity lies on the other side of complexity.” Harnessing the skill, energy and hearts of many is often viewed as complex. This simple philosophy when delivered throughout the entire organization will bring an organizations’ culture together. The fundamental formula of the seven tenets formatted in The Canoe Theory book recognizes that everyone being part of the same team and “rowing” all in the same direction is essential for growth, profitability, employee and shareholders’ satisfaction! This simple yet powerful metaphor is a game changer for obtaining results. Once the organization embraces The Canoe Theory mindset, recruiting at any level will ensure selecting the right talent. Hiring the wrong individual is an expensive proposition that not only costs the company money, but often destroys cultures. The Canoe Theory has been field tested in masses of industries and with large and small companies alike. The end results are increased employee satisfaction, retention of top talent, attracting key new members of the team, higher performance at all levels and a new refreshing level of accountability. Leadership Mechanics has been developed for the emerging new leader. Its focus is on developing the primary skills required of a great leader such as: motivating, conflict resolution, uniting, building, developing, mentoring, communicating and retaining an elite team. Leadership is the key to an organization reaching its goals. It is for these reasons Dialexis has developed Leadership Mechanics For The Emerging Leader. How often we have seen top performers thrown in a leadership role with any proper guidance. Therefore, Leadership Mechanics is applicable for those aspiring to improve the tactical aspects of managing/leading an operation. The information has been derived from real world experiences and is presented through case studies, lectures, role play and open forum dialogue – “real world”! NEXT Level begins with strategic confidential research to determine the existing connection or lack of connection with Leadership’s vision. This valuable information is confidentially used to coach the Executive Leadership Team in reconnecting and strengthening the organization. Dialexis provides a one-year path to re-connect employee commitments and re-set leadership’s operational strategy. Prior experience has revealed an 87% disconnect between leaderships declared vision and the employee’s belief in that vision. The opportunity is surprising since initially most leaders would suggest “we are working well with each other”. As Edwards Deming suggested “we are often working hard at doing it wrong”. Alignment and understanding of where the organization is going takes on a new level of responsibility for everyone in the organization. Note: Although the impact of this course is intense and recommended only for leaders that are willing to attend with an open mind, it has the platform to shift leadership results immediately. Senior leadership should select only candidates that are ready for a major shift in performance. DiSC for Leaders allows all level of leaders to understand their personal style of leadership, their strengths and opportunities. This personalized learning experience allows participants to read the style(s) of the people they leading and how to adapt their own style according to who they are coaching. The results are transforming and each participating leader leaves being able to manage more effectively. Discover the Impact of the Five Listening Approaches and listening styles. It’s estimated that people screen out or change the intended purpose of what they hear in over 70% of all communications. The biggest factor contributing to such miscommunications is our listening approach. Behavioral research shows that people listen with a preferred listening style. This interactive session allows each participant to walk away with new skills of Listening. The ability to master listening is essential for anyone – leaders, sales people, deal makers, account managers, technical or customer service staff – anyone that interacts with anyone! Appreciative: Listens in a relaxed manner, seeking enjoyment, entertainment, or inspiration. Foundations of Achievement – The fundamental differentiators top performers consistently execute. How Mindset Plays a Significant Role in Achievement –The difference between mechanics and mindset in the world of performance. Excellence in Leadership – Based upon a 15-year leadership study that revealed startling evidence of leadership disconnects with rank and file. How to Move the “Stuck in Middle” Sales Group to the Top – Strategies for sales managers. Developing High Performance Teams – Key aspects focused on the importance of leadership in small team environments. Developing Rookie Sales Talent –What it takes to capture the mindset of the new sales rookie. Distinctions of High Performance Salespeople – Based upon 20 years of interaction with top performing salespeople. Converting Mission Statements into Crusades– A strategy leaders can enact to inspire employees to participate fully behind a corporate initiative. The Canoe Theory Leadership – building a ‘team” of high functioning individuals! (Based on the speaker’s book) – Moving from Complex to Simplicity – aligning your company! Two Keys to Moving Average Salespeople into Top Performers– Based upon 25 years of research and field training of salespeople. All Oil Wells Dry Up– The myth that driving more revenue from existing accounts will protect the organization. Build Leadership –The process of moving from ‘manager’ to a Builder Leader. Dialexis provides a Master Trainer for all face-to-face trainings at an organization’s facility or location of choice. The on-site experience represents the very best experience for most Dialexis offerings. On-site training provides a stimulating experience for attendees and leadership. For organizations that may be out of logical range to conduct in person on-site coaching, Dialexis offers telephone or tele-conference coaching. Sessions may last 1 – 2 hours on a frequency determined by client leadership. Dialexis offers a workshop format for topics that are best achieved in small group teams such as Value Statement, Objection Handling, Initial Meeting Framework, and LinkedIn/Social Media presence Dialexis provides the facilitation. Certified Coaches play a critical role in everyday support. Teams frequently require re-tuning in the training mechanics taught. As a result, the Player Coach becomes the ‘go to’ for on the spot answers. With the Certified Coach model, the training is identical to the Certified Trainer model with exception of having to Solo-Instruct a class. The Certified Coach is then prepared to interact with the organization as an expert in the process. Having a Certified Coach inside the operation provides team members with instant access questions and solutions to challenges. This process allows the energy and interest to be maintained. The organization’s investment is insured. Every component of SOAR Selling is available on-line in 7 independent components. Candidates learn SOAR Selling 24/7 from their computers or tablets and do so at their own pace. The instruction is engaging, easy to comprehend and provides identical platforms as the live-training and is cost effective. Webinars are effective for those organizations that are challenged by bringing their personnel together in a single location. In a short 1.5-hour segment or over a series of segments, training can be delivered with significant clarity. Although nothing beats a live presentation, webinars coupled with individual coaching or online training as reinforcement, bring comprehension to an impressive level. Once Dialexis trainings are delivered, Dialexis offers on-site coaching as a follow up platform for continued learning. Maintaining the integrity of our client’s investment is substantially supported by the implementation of the Train-The-Trainer process. Once the initial training is completed the certified corporate trainers maintain the momentum and energy initially introduced to the organization. As a result, the organization’s capture of net-new business and net-new logos continues throughout the year. Candidates for the certified program are immersed in a 3-day training session with a Master Instructor. Upon completing the instruction, candidates are required to demonstrate competency by Solo instructing a class. This is done under the supervision of a Master Trainer.